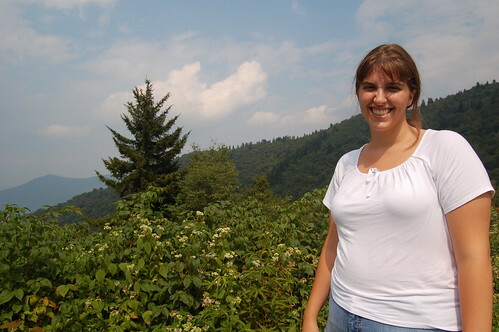 After lunch on Friday, we got on the Blue Ridge Parkway. 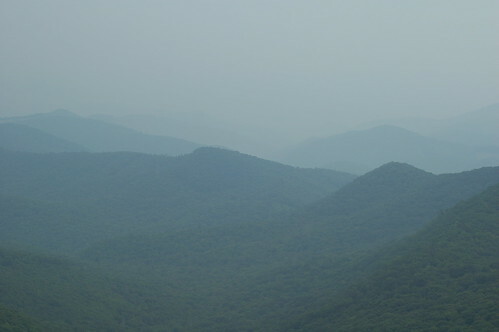 Almost immediately, we saw an overlook and stopped to check it out and take some photos. We were overwhelmed with what we saw, and that was just the beginning. 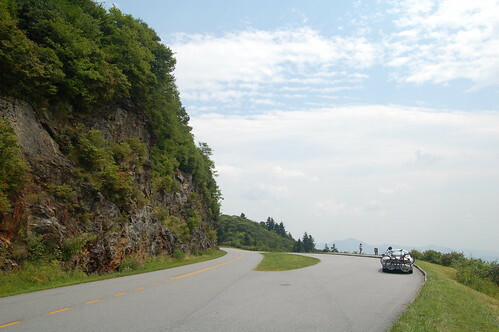 The Blue Ridge Parkway is not an efficient way to get anywhere, with a parkway-wide speed limit of 45 mph, and many sections where it’s not safe to go that fast because it’s a winding mountain road. But our friends in Charlotte had to work that day anyway, so we figured we’d take our time getting there. The section we were on had numerous tunnels, which were pretty cool. We saw a few cyclists, and I have to admit I was tempted to get the bike off the back of the car and start riding. It was a very hot day, but we didn’t care. I was still in awe that I was in the presence of so much beauty. Then again, that’s a feeling I get every day with Sarah. The mountains were nice, too. 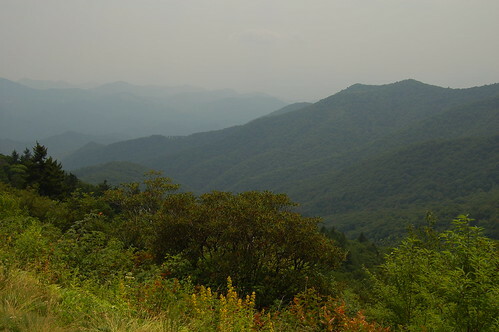 The Blue Ridge Parkway has overlooks very frequently, and we had to resist the temptation to stop at each and every one. Driving on it is almost like being immersed in a gigantic slideshow, passing overlooks on both sides. Looking back at our photos, they all seem to run together now, but when you’re there, the feeling is intoxicating, and each overlook takes on its own personality. 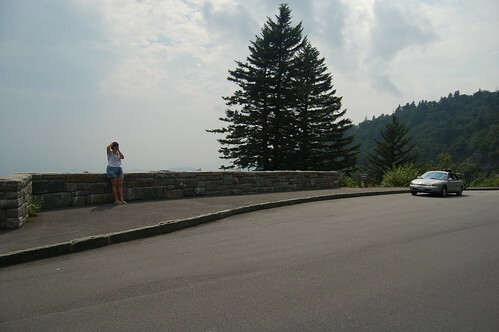 At one overlook, I stood on the roof of the car (much to Sarah’s dismay) to get a better angle. You can see a photo of me on the car on Sarah’s blog. 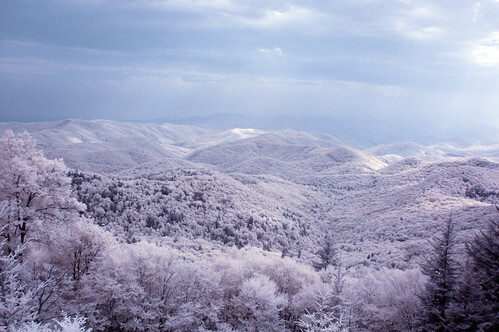 I experimented with some infrared photography at some of the overlooks. Here are a few examples. After a while, we stopped taking photos and mostly drove through. We played some Telefon Tel Aviv in the car, which is one of our favorite groups. They also happen to make incredibly gorgeous music, which was a perfect backdrop for the scenery. We hadn’t had enough, but we had spent so much time gaping and taking photographs that if we needed to get moving. 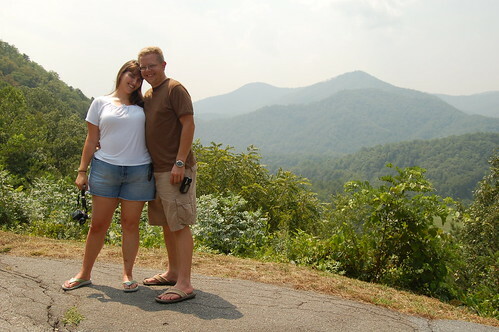 We ended up driving about 90 miles on the Blue Ridge Parkway, and even that drive itself takes a long time. 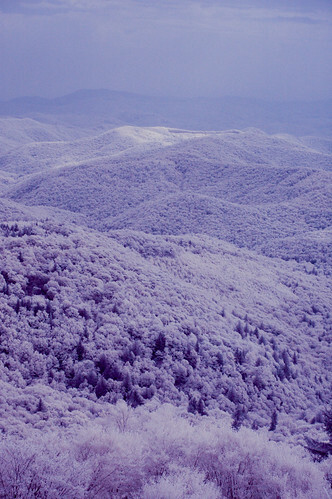 Those infrared shots are pretty cool. How did you do that? Wow some great shots here and in the earlier posts. Looks like this was a great trip – I look forward to reading the rest of the entries. I’m leaving on some vacation myself (in just a couple of hours actually 🙂 so I’ll have to catch up when I get back. Dan, I did the infrared shots by putting a Hoya R72 filter on my camera. It filters basically all but infrared light, which means you can’t see anything when you look through the viewfinder, and I have to use a tripod because the exposures are longish. I also did some post-processing, setting a custom white balance and swapping the red and blue channels and making some levels adjustments, to adjust the false color. 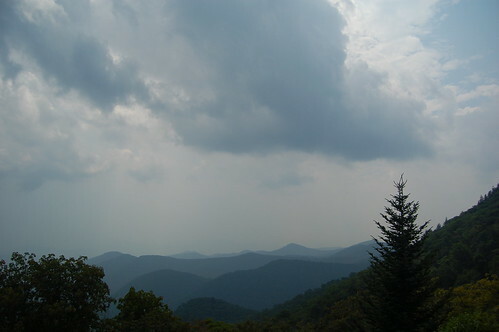 The Blue Ridge Parkway has overlooks very frequently, and we had to resist the temptation to stop at each and every one. See how much you miss when your in a car. 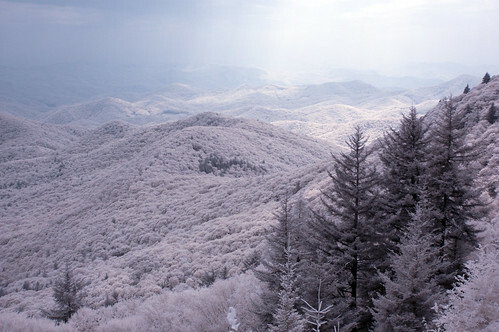 Great shots – makes me want to go now. And you music selection is pretty funky to say the least. I don’t think I’ve heard of any of those bands before. LOL.